Muzzle devices of all types including flash-hiders, compensators, thread-protectors, and suppressor mounts. Use this when mounting your A2 or similar flash-hider on barrels threaded with 1/2X28 TPI. It is suitable for Aero Precision's and most other manufacturers 5.56X45 NATO, 223 Remington, 300 Blackout, and similar chambered barrels and more. Use this when mounting your A2 or similar flash-hider on barrels threaded with 5/8X24 TPI. It is suitable for Aero Precision's and most other manufacturers' 308 winchester, 300 Blackout, and 6.5 Creedmoor chambered barrels and more. Like the more familiar A2 flash-hider found on the venerable M16/M4 series of rifles, this version is threaded with 5/8X24 TPI and is suitable for Aero Precision's and most other manufacturers' 308 winchester, 300 Blackout, and 6.5 Creedmoor chambered barrels and more. 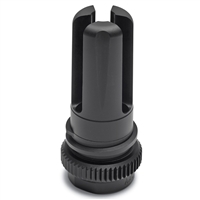 The BLACKOUT Flash Hider Installation Tool from Advanced Armament Corp. enables armorers to quickly and easily install and remove a three-prong BLACKOUT™ flash hider or BRAKEOUT. The tool uses a 3/8 drive. The VG6 EPSILON 556 is the pinnacle of AR15 muzzle devices. The EPSILON 556 just outperforms everything on the market. Designed for the discriminating shooter and professional end-users, VG6 Precision's EPSILON 556 affords you the best muzzle control and recoil mitigation the industry has to offer. This is a true combination muzzle brake / compensator / flash hider. Its performance is matched only by the amazing look of this device. The VG6 Epsilon 556 carries many of the same characteristics as the Gamma 556 with a few exceptions. Extended flash hiding prongs and no ports at the 12 o'clock positions allow uninhibited view from flash through optics or sights. The difference in porting is also noticed on the underside of the device where it has 6 valve holes to allow the fastest gasses reaching the second chamber to exit. This creates very soft low energy recoil that allows for absolute control. The VG6 GAMMA 762 is a high performance muzzle brake for eliminating recoil. It was designed using state of the art engineering techniques, utilizing CFD (Computational Fluid Dynamics) and CAE (Computer Aided Engineering). This product is 100% CNC machined for optimal performance. The BLACKOUT flash suppressor is the most efficient design available. The proprietary features eliminate muzzle flash, even on CQB-length barrels. The BLACKOUT® is inherently stronger and more impact resistant than four prong designs, while not being subject to the rapid erosion of closed-ended units. A high strength corrosion-resistant aerospace alloy, and ultra-hard Nitride finish provide the highest level of durability. Military tested and selected.